We are the typical lazy, Sunday brunch couple; late Saturday nights spent in company of friends or just each other, waking up close to noon on Sundays, just in time for early lunch or as is common in these parts - Brunch.. The only difference between us and scores of other NY-ers is that we don't drink and we don't do the long brunch lines (unless ofcourse we plan to do just that with friends). So, our typical first meal of Sunday is not eggs benedict with a side of OJ and strong coffee; more like a leisurely chai with many many glucose biscuits and then regular lunch. Last night, I had a sudden craving for a typical NY style brunch with the eggs, muffins et all. But, all my craving did not overpower my abhorrence of standing in line in the freezing cold and smiling about it! So, it was to be Brunch at home, cozily warm and leisurely lazy.. no need to wake up early to beat the rush at 11:30! YAY! 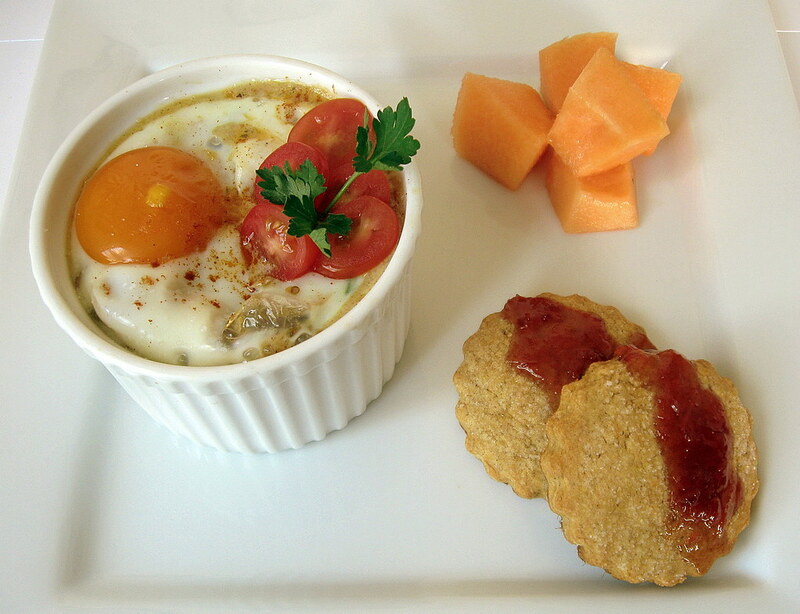 My menu - Eggs with hash, breakfast scones and fruit. Rummaging around the net and in my pantry and fridge, I found inspiration, sweet potato, ham and half a head of cauliflower. 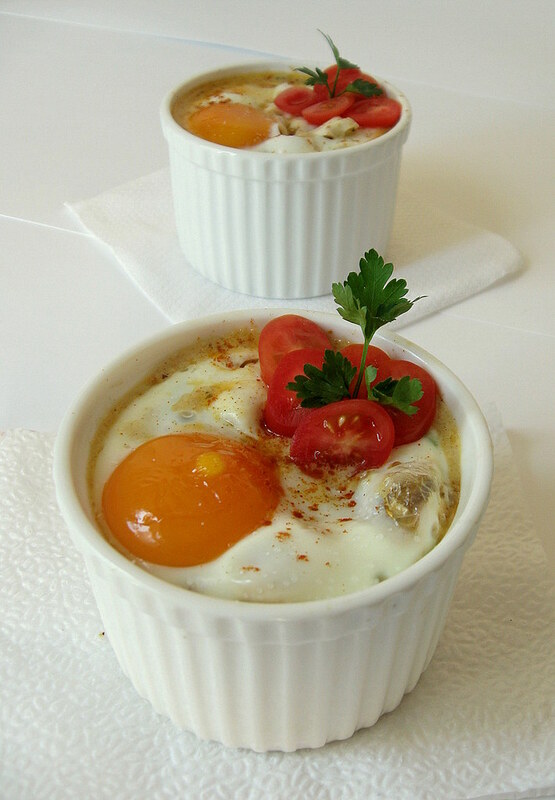 Passing by Chocolate Shavings, I found this lovely recipe for baked eggs. From there, it was simple stretch of imagination to incorporate what I had on hand (Early morning shopping is a strict no-no!).. There! I had my first item - Potato and Cauliflower Hash with Mozzarella topped with Baked Eggs. My perfect brunch has to have a little sweet element to it. Usually I order french toast and nibble on hub's eggs. Today, I decided to go with scones. After my first success with the British breakfast item, Orange Yogurt Scones, I have just been hooked to them in general. Sweet Potato is the chosen ingredient for this month's Beet 'n Squash You, hosted by Melody and Leela. Drawing inspiration from pumpkin spice scones, I chose to accompany my egg dish with Sweet Potato and Cinnamon Scones topped with a Blood Orange & Maple Sauce. Toss the cauliflower in a little oil, salt and pepper and roast in a 350F oven for 15 minutes until crisp and cooked. Meanwhile, in a skillet and lightly saute the ham in a little oil. Add the onion and garlic and saute till soft. Season with salt, pepper and other seasoning. Add diced, cooked potato and toss for a couple of minutes. Remove from heat and transfer to a mixing bowl. Toss in the roasted cauliflower and set aside to cool until ready to assemble. Just before assembling, add the cream and parsley to the hash mixture and stir to incorporate. Brush the inside of two 10 oz ramekins with butter. Divide half of the hash mixture equally between the two ramekins. Layer the mozzarella over this. Top with the remaining hash mixture. Break the eggs one at a time in a small bowl and gently transfer to the top of the ramekins. Sprinkle a pinch of salt to season the egg. Cover with foil (to ensure that the yolk doesn't cook faster than the whites). Bake at 350F for 20-25 minutes until the egg is set and whites are cooked. Garnish ramekins with the tomato slices, parsley and tiny sprinkle of paprika. Serve immediately. In a medium bowl, sift together the flour, baking powder, soda, salt and cinnamon. Using a pastry cutter or two knifes, cut in the cold butter so the mixture resembles a coarse meal. In a small bowl whisk together cream, potato puree and brown sugar. Add the wet mixture to the dry and bring together to a form a crumbly dough. Scrape the dough to a lightly floured surface and bring together to form a dough ball. Pat to form a circle of about 1 inch thickness. Wrap in plastic and refrigerate for atleast 30 minutes. When ready to bake, remove dough and thaw for 5 minutes. Then roll it out on a floured surface to 1/2 inch thickness. 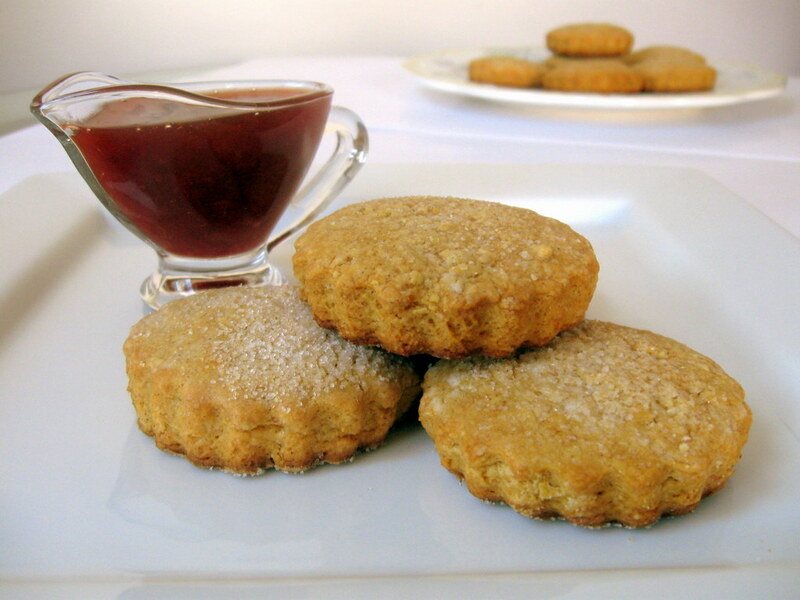 Using a cookie cutter of your choice, cut out scone shapes. Place on parchment paper. 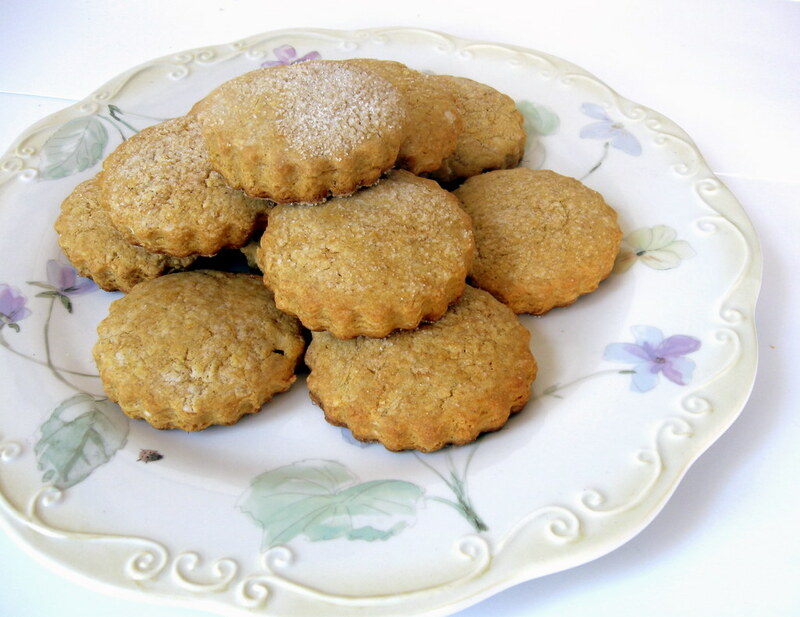 Brush the tops with butter and sprinkle sugar. Bake at 400F for 15-20 minutes, until the tops are golden and a toothpick comes out clean when inserted. Over medium heat, bring the above ingredients to a boil. Whisk in the corn starch. Lower heat and let simmer for 2 minutes. Remove from heat and cool to warm. Pour over scones and serve.